John Middleton, Shanan Custer, Carin Bratlie Wethern, and Mark Benzel at Park Square Theatre. Photo by Kit Bix. 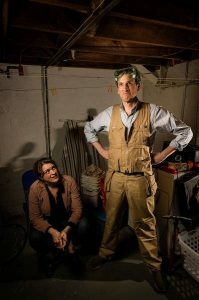 Theatre Pro-Rata’s latest offering, Up: The Man in the Air, opens Friday, May 26 at Park Square Theatre’s Andy Boss Thrust Stage. This “fantastical biography” was inspired by the true story of Larry Walters, an amateur inventor who decided in 1982 to attach 45 helium weather balloons to a lawn chair…and floated up to 16,000 feet. Walters’ flight briefly attracted the attention of the national media and as well as the aviation industry. After his very brief experience of celebrity passed, Carin Bratlie Wethern notes, Walters “spent the rest of his life chasing the echo of that dream”. 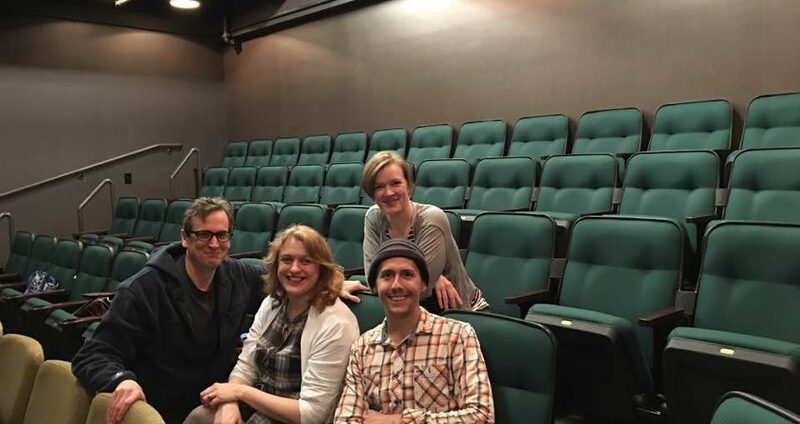 Karen Bix sat down with director Carin Bratlie Wethern and actors Shanan Custer, John Middleton, and Mark Bazel to discuss the show and its creative process. Carin, what drew you to this play? Carin: I love the way that Walter’s story is both bittersweet and hopeful and [how the play portrays] what Walter is going through and what he’s striving for. I also loved that Philippe Petit was a character. Philippe Petit is, of course, the French high-wire artist best known for his walk between the two World Trade Center towers in 1974. Were you a fan before this? Carin: I had seen Man on Wire and I was really fascinated by him. Of course, I didn’t have nearly the depth of information about him that I do now. In the program notes, you talk about the difficulty of assigning Up a genre. Carin: I think Park Square is billing it as a comedy drama and that seems too broad. Yes it’s a comedy in the sense there are funny bits in it but ultimately it’s not a pure comedy. Mark: (joking) Would you say musical? Carin: No, it’s not even a dark comedy. It’s more like a fantastical biography. It has elements of magical realism and fantasy in it, but it’s also based on a true story. Walter actually did tie weather balloons to a lawn chair in 1983 and flew 15,000 feet, and he had his fifteen minutes of fame. And he never did anything else famous and ultimately he committed suicide. He shot himself in the heart in the middle of a forest. The play doesn’t really follow his life. It’s more inspired by the idea of striving for something that you’ve accomplished once, and then always looking back and wanting to recapture that faded glory. John: The playwright seems interested not in telling his story but in going into these themes: What is it like to do something like that, and then, what do you do after? John: And it comes down with a thud. That strife between the dream of recapturing a glorious moment in one’s past (or, in Walter’s case of sublime freedom) and the demands of real-world obligations resonates with almost anyone over a certain age. Flying is such a powerful metaphor for that. 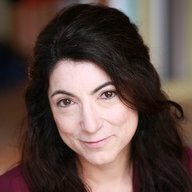 Carin, are there any particularly unusual, exciting production features that you want to – or are willing to – share before the play opens? Carin: We’ve hemmed and hawed about that question: Do we reveal that there’s actual wire-walking in the play in advance? And, ultimately, we decided “yes” and that [this element is] something to share and to be excited about. When you open up the script and you read that “Philippe Petit walks the wire”, [as a director] you think, how are you going make that happen? There are a handful of stage directions that indicate that you can have some freedom with how you interpret that stage direction. For instance, the wire walking could just be an actor walking on a line painted on the floor or it could be portrayed in a silhouette. I am very proud that Mark is going to perform [actual] wire-walking. And he’s been working with the circus community in town for months to learn that skill and to bring it to the show. Mark, you play Philippe in the play. Do you have a circus background? Mark: A little bit. I always find myself in the position where I’m doing something ridiculous. A couple of shows ago I learned to do aerial silks. And that just seems to continue to be a vocabulary that I build. And we have great resources and a great community within the Twin Cities to do that. There’s Circus Juventas – and they’ve been lovely to us – and Bob Rosen and Studio 206. All across the board, people have just really been helpful. No matter what amount of discipline and determination I might have, without those folks being available to us it would have been a lot harder. Can you say a little about Man on Wire and how the film and your physical preparation helped you develop the role? Mark: Man on Wire was a documentary based on Philippe’s walk between the Two Towers [of the World Trade Center in New York]. I believe it won an Academy Award the year that it came out. It’s a documentary in the genre of a bank heist, because the walk was really quite an undertaking. [It had to be carried out in secret and required cooperation of many of Petit’s friends.] But the film also very much carries the spirit of the man. As for the other question, the physical world of Philippe is definitely central to his being and it informs his worldview. Philippe is very much a philosopher; once I started to invest a lot of time in wire-walking, I was able to understood how a lot of that philosophy comes from the sense of presence and meditation that you get when you’re on the wire It’s very clear why someone who had the kind of life that Philippe had would cultivate that. And Philippe’s philosophy as you describe it sheds light on what flying means and has meant to Walter. The director’s notes state that Philippe serves as “part mentor [to Walter], part advocate, part Harvey the Rabbit: Philippe also ushers in moments of magical realism as we peek inside Walter’s mind.” In the play, Walter’s interactions with Philippe seem essential in that they give us a sense of what drives Walter – of his inward passions and how his dreams of flying again (and higher?) inform what he understands to be his purpose in life. Is the dreamer side of Walter something that you admire? Are there aspects of Walter that you don’t like? John: Well, the dreamer part is very compelling. That idea of just doing this thing you love for no good reason, and not relying on anybody else for it. There’s a courage to that. And it’s admirable. On the other side is the lack of responsibility – the real world stuff that Walter is incapable of managing. And a lot of that hits way too close to home, and that’s really painful to hang out with. John: And it doesn’t feel like he’s shirking responsibility. He just can’t do it. There’s just stuff he cannot do. Shanan, you play Helen, Walter’s wife. The two of you have a teenage son, Mikey; Helen is the family breadwinner. She has a pretty mundane job she’s not crazy about and it only barely pays the bills. And so she’s frustrated with Walter’s apparent lack of concern about the family finances. How did you approach this character? What are the challenges? Do you know this person? Shanan: Helen is married to someone who has a lot of dreams and I think she fell in love with that passion. But then she’s put in the position of having to make sure that – and I’m sorry for all the metaphors – but that they stay afloat. That they actually survive. And it’s a very hard position to be in: killer of dreams and I have a lot of empathy for her. I mean, I feel for her (and I respect what she’s doing in the play), but I also love what she fell in love with, that part of Walter. I like [to portray] people who are very believable. And I see a lot of Helen in myself. Is there a piece of dialogue that captures Helen’s perspective at this point in her life? Carin: There’s so many shades of gray to these characters. There’s also a character, Maria, who is a pregnant teenager. She has one of the most fascinating teen pregnancy stories that I’ve seen depicted onstage because she’s not a victim, she’s not “in trouble”– I mean she was unexpectedly pregnant – but if anyone is going to be able to just fine, it’s going to be her because she’s very strong and very self-assured. Mark: Yeah, one of my earlier lines is “A bird doesn’t need a leash”. That very much speaks to what I’ve come to know about the character and his ideas about the grounding nature of attachment [as opposed to the notion of] any existence beyond the here and now. How does having worked together affect your process? John: With every play you start from zero and you have to figure out that the world of the play is, but when you’ve worked with someone, you’re able to move through it more quickly. You still have to go through A-B-C, but you go through it faster. Carin: You sort of gear shift through period of “getting to know you” more quickly, and that it makes it easier. Because there’s history there. 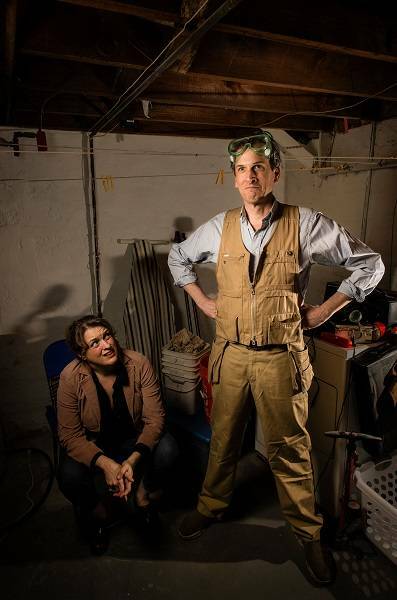 Theatre Pro Rata’s production of Bridget Carpenter’s Up: The Man in the Flying Chair plays May 24-June 11 at Park Square Theatre’s the Andy Boss Thrust Stage.